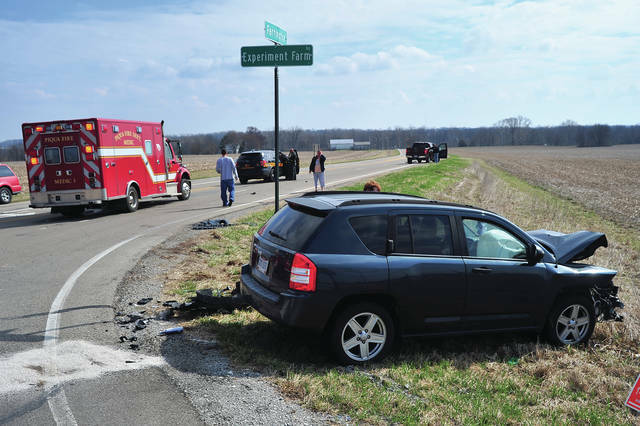 Authorities investigate a two-vehicle crash that occurred on Farrington Rd. at Experiment Farm Rd. around 11 a.m. on Saturday. An SUV pulled out in front of an eastbound pickup truck. There was moderate to heavy damage reported. None of the victims were transported from the scene for treatment. The crash in under investigation by the Miami Co. Sheriff’s Office. https://www.dailycall.com/wp-content/uploads/sites/30/2019/04/web1_040619mju_crash_farrington.jpgAuthorities investigate a two-vehicle crash that occurred on Farrington Rd. at Experiment Farm Rd. around 11 a.m. on Saturday. An SUV pulled out in front of an eastbound pickup truck. There was moderate to heavy damage reported. None of the victims were transported from the scene for treatment. The crash in under investigation by the Miami Co. Sheriff’s Office.